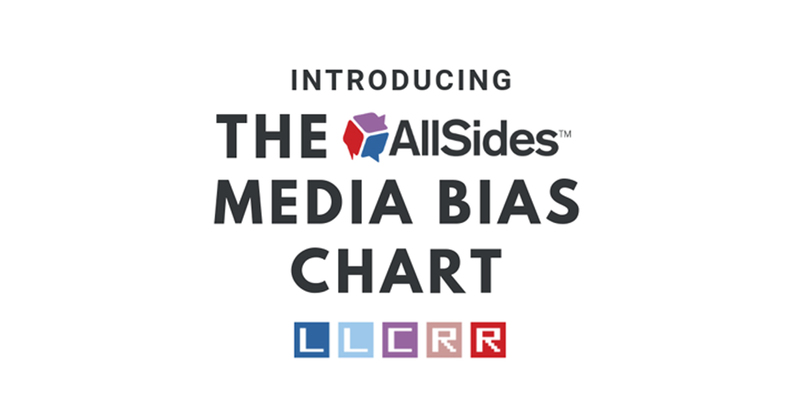 Introducing the 2019 AllSides Media Bias Chart, an easy way for you to identify political bias in the news so you can be better equipped to navigate our increasingly polarized media landscape. (And don't miss our full and growing list of almost 600 media bias ratings). Americans are more polarized than ever — if you’re like us, you see it in the news and on your social media feeds every day. Bias is natural, but hidden bias and fake news misleads and divides us. That’s why AllSides has rated the media bias of nearly 600 media outlets and writers. The AllSides Media Bias Chart shows the political bias of some of the most popular news outlets in America. 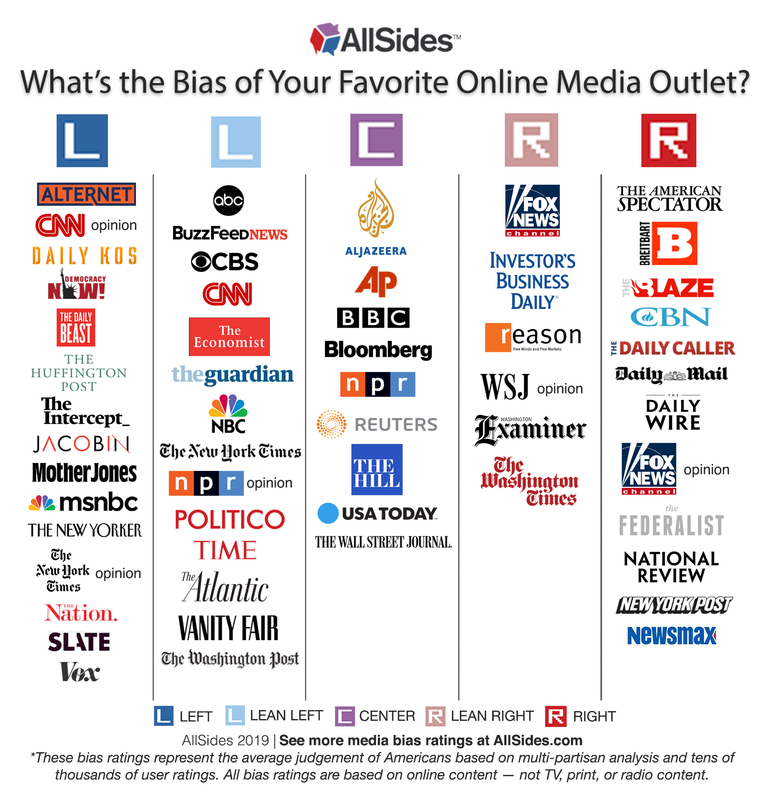 The AllSides Media Bias Chart is more comprehensive in its methodology than any other media bias chart on the Web. While other media bias charts show you only the subjective opinion of the one person who made it, our Media Bias Rating Methodology is based on data gathered from people from all over the political bias spectrum — not just one individual. Our ratings reflect the average judgement of the American people. Help to depolarize your newsfeed by sharing the media bias chart on Facebook, and check out commonly asked questions about the chart below. Why Does the Bias of a Media Outlet Matter? Media bias has contributed to making Americans more politically polarized than ever. When we can’t identify, understand and appreciate diverse perspectives, we can’t problem-solve or compromise. Democracy suffers. The mission of AllSides is to free people from filter bubbles so they can better understand the world — and each other. Making media bias transparent helps us to achieve this, and improves our democracy long-term. There is nothing inherently wrong with bias — bias is natural. If you’ve got a pulse, you’ve got a bias. But hidden bias misleads and divides us. News media, social media, and search engines have become so biased and personalized that we are stuck in filter bubbles, where we’re only exposed to information and ideas we already agree with. We often end up hating the “The Other Side,” believing they’re wrong or evil. At AllSides, we believe reducing the one-sided information flow by providing balanced news and nearly 600 media bias ratings can help us to better understand diverse perspectives and reduce hateful polarization in America. By making media bias transparent and consuming a balanced news diet, we can arm ourselves with a broader view — and decide the truth for ourselves. How Does AllSides Calculate Media Bias? Our media bias ratings are based on data gathered from years of multi-partisan analysis, including blind surveys, editorial reviews, community feedback, third party data, and over 100,000 user bias ratings. Visit our AllSides Media Bias Rating Methodology page to learn more and view a video on how this works. Our ratings are scientifically driven and based on multipartisan analysis, not the subjective interpretation of one individual. That means our bias ratings are more robust than other media bias charts on the Web, and reflects the average judgement of Americans. We update our media bias ratings on a continual basis as more information is gathered and news outlets shift their bias over time. How Did AllSides Decide Which Media Outlets to Include on the Chart? We took into account whether the source was a top outlet in terms of traffic according to Pew Research Center, as well as whether or not it was featured on other media bias charts floating around the Web. What Does It Mean for a Media Outlet to Be Left, Center, Right, or Anything Else? Does a Center Rating Mean Neutral and Unbiased? It's important to note that a Center media bias rating does not always mean neutral, unbiased or reasonable, just as "far Left" and "far Right" do not always mean "extreme" or "unreasonable." A Center bias rating simply means the source or writer rated does not predictably show opinions favoring either end of the political spectrum — conservative or liberal. Sometimes, a media outlet with a Center rating misses important perspectives, leaving out valid arguments from the left or right. While it may be easy to think that we should only consume media from Center outlets, AllSides believes Center is not necessarily the answer. By reading only Center outlets, we may still encounter bias and omission of important issues and perspectives. For this reason, it is important to consume a balanced news diet. Learn more about what an AllSides Media Bias Rating of Center rating means here. You can think of our bias ratings as points of view, each providing pieces of the puzzle, so that we may have a more holistic view. Why Are Some Media Outlets On The Chart Twice? A key way the AllSides Media Bias Chart differs from other media bias charts on the Web is that we often make a distinction between the source’s news content and its Opinion/Editorial content. This is true for prominent and widely-read media outlets, such as the Wall Street Journal or the New York Times. The distinction helps readers to contextualize the differences in bias between news content and opinion page content. For example, on this chart you will see The New York Times Opinion is rated as a Left media bias, while the New York Times (News Only) is rated Lean Left. Fox News Opinion content has a Right media bias, while Fox News (News Only) is Lean Right. And so on. When rating an Opinion page, AllSides takes into account both the paper’s editorial board andthe paper’s individual opinion page writers. The editorial board’s bias is weighted, and affects the final bias rating by about 60%. For example, the New York Times has a range of individual Opinion page writers, who have a range of biases. Yet The New York Times Editorial Board has a clear Left media bias. We take into account both the overall biases of the individual writers and the Editorial Board, and give the New York Times Opinion Page a final media bias rating of Left. We also provide individual media bias ratings for each Opinion page writer. See how we did it for the New York Times Opinion page writers here. Visit the AllSides Media Bias Ratings page and search for any outlet for a full summation of our research and how we arrived at the rating. Visit our company FAQ for more information about AllSides. I Disagree With Your Media Bias Ratings. Where Can I Give You Feedback? You can vote on whether or not you agree with our media bias ratings directly on our Media Bias Ratings page, or contact us.